In this episode, my guest is Alistair Michener of Drawboard. Drawboard has developed an app and a SaaS product, that allow annotation and mock up of digital drawings in PDF form and their company has had massive growth over the past 12 months, partly because of a partnership with Microsoft which resulted in the Drawboard App coming pre-installed on various Microsoft Surface Devices. We talked about the challenges of a rapidly growing startup and also the secret, to understanding your customer needs and providing an awesome user experience. Drawboard has developed a couple of apps that allow annotation and markup of digital drawings in pdf form. One of their apps comes pre-installed on several Microsoft Surface devices. Alistair was motivated to develop Drawboard because he saw a need – engineers like to markup and annotate design documents and did that with pen and paper – the document workflow was broken! There were issues with different people working on different copies and version control. Alistair started exploring this idea and asking people, is this going to be the way engineers markup drawings in a year – and was told no, not that quickly. What about five years? Or ten years? He found that almost everyone said, yes in ten years, this is what we’ll all be doing. So he said to himself, why not now, and why not me? Between 9-30% of total project cost on construction comes from re-work that arises from version control problems. As well as that, the amount of paper used for multiple copies of drawings is astounding. So the savings achievable by Drawboard apps are considerable. Partnership with Microsoft has been invaluable in helping define direction for the app development, as well as merchandising the app on their app store. Drawboard solved a real problem and were focused on delivering a great user experience – Microsoft recognised that this app matched really well with their environment and supported the Drawboard app. Drawboard, the company, has had rapid and huge growth in 2016. As an innovative and a start up company you want to keep the team small as possible for as long as possible without burdening the team and at the same time without stifling growth and product development. You want to be nimble and make quick decisions. You also need to build the culture of the organisation. The culture comes from the leadership of the team. Drawboard PDF is the app for the Windows mobile platform, Bullclip is a SaaS service to do the same type of things on a web browser. Partnership with a large company who has a good platform and sales channels, like Microsoft, is key to success of a software company, particularly in the SaaS market. You can worry about a lot of things, like competition or changing markets, but if you control the controllables, your energy will be focused on things that can make a difference. Here are Alistair’s answers to the questions of our Innovation round. Listen to the interview to get the full scoop. #1 thing to be more innovative – Be open, be creative and give your ideas a shot. Best thing for new ideas – Have “water cooler talks” or spontaneous team meetings and when someone comes up with a good idea, make sure that they have the confidence to be able to follow that through. Favourite tool for innovation –Make meetings comfortable, so people talk freely. Good task management tools, like JIRA and Trello. Keep project / client on track – Stand up meetings and then follow the agile methodology. Have a daily check-ins. Differentiate – Use your strengths. Be fruitful in finding a way into the market just experimenting, coming up with different ideas and talking to your business team members. Be confident and go into the unknown with a big heart, whether that’s taking a leap of faith or stepping outside your comfort zone. You can reach out and thank Alistair via Twitter (@almichener) and Email. Mention this podcast. 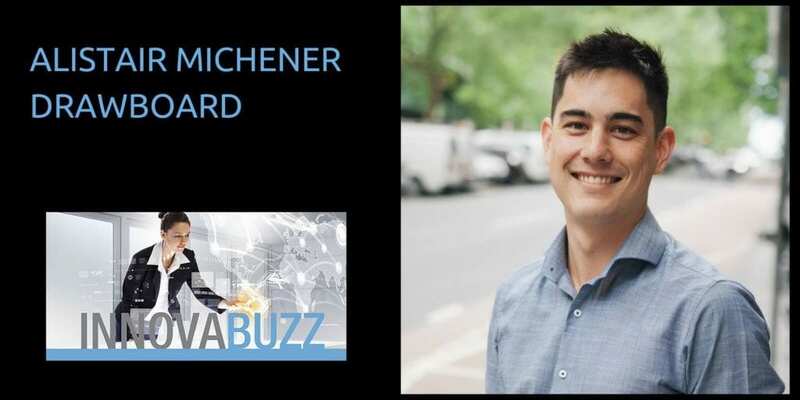 Alistair suggested Andrew Yap of Medtasker for me to interview on a future InnovaBuzz podcast. We’ll be sending out an invitation! So Andrew keep an eye on your inbox, for an invitation from me to the InnovaBuzz podcast, courtesy of Alistair Michener from Drawboard.